If you’re sensing that you’re destined to be thrashed at mini-golf, start talking three weeks in advance about how nice the weather has been, and how lucky you and your ludicrously bearded husband have been with it. Fate, tempted as it will undoubtedly be, will conspire to ensure a heavy dousing every time you’re near a mini-golf course for your final week in the country. It seems whilst you lucky sods in the UK have been enjoying an early summer to usher in the brothers Cameron and Clegg (the similarity is suspicious), we have been having our worst sustained weather of the trip so far. Here’s a brief update to round off our time in New Zealand. After our stay in Hanmer Springs we had planned an energetic long walk and the aforementioned mini-golf humiliation for Jane, before we drove to Christchurch. When the rain came in we amended our plans to include a much less energetic lie-in, drive to Christchurch and spicy lamb dosa for lunch – our first taste of curry for over 4 months! Our walking tour of Christchurch that afternoon showed us that it’s a perfectly presentable city, but without much to actually go and see, and with the same almost deserted pavements as we’ve seen consistently during our stay in New Zealand. We curtailed the walking tour and headed back to our slightly ropey campsite where we found ourselves to be the only non-tattooed “guest workers” staying (lets face it, it was a trailer-park full of scary sub-normals). The following day we’d planned to walk the bridle path to Lyttleton, but naturally the path was closed, so we drove to Lyttleton instead, to walk from there. The tourist information office was, of course, closed. No matter – we set off to find the other end of the bridle path, only to find slopes like those found at the south face of Everest. 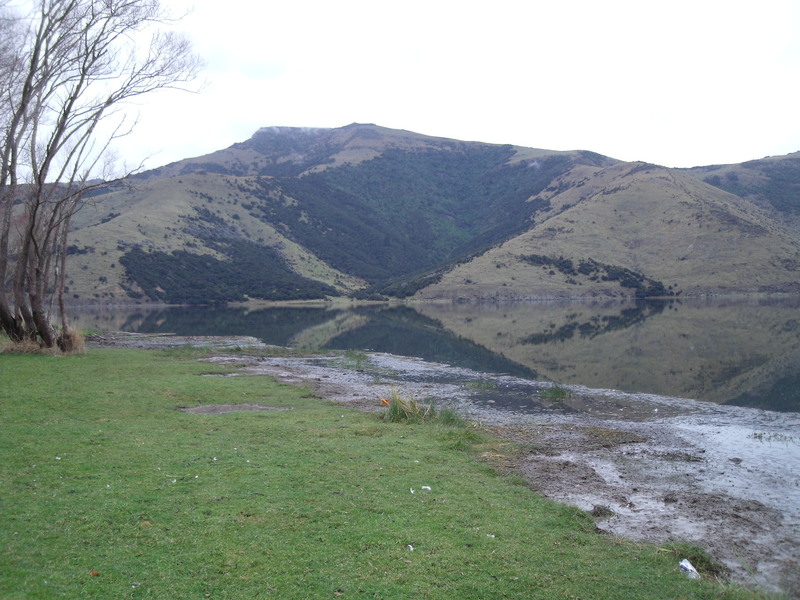 Our screaming legs took us swiftly back to the van to drive back to Christchurch for petrol, and then onwards to Akaroa on the Banks Peninsula, just south of the city. 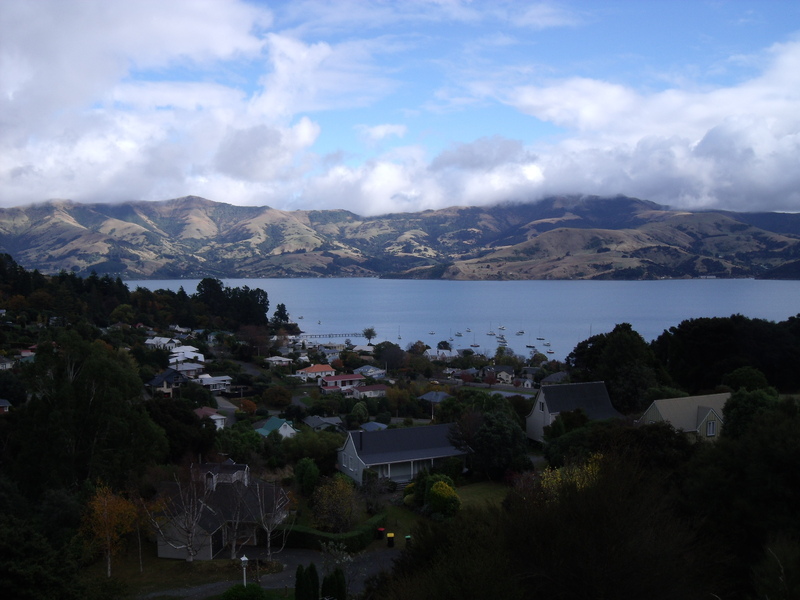 Akaroa is a lovely, small coastal town, which worryingly thinks it’s in France – everything is Frenchified, apart from the people thank goodness. 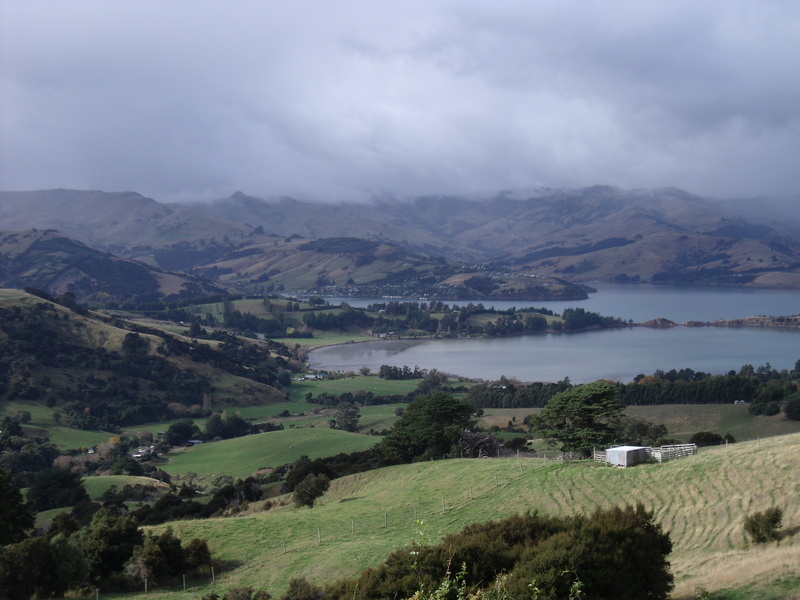 After a fairly gloomy couple of days, both in terms of weather and activities, we were hopeful that our Akaroa walk would bring better fortune. We were shown otherwise when, 20 minutes into our walk, we were no more than 200 yards from the start of it, on a construction site, in spite of having paid a dollar for the walk guide leaflet. After failing with our recent walks and feeling a little lardy, we were determined not to be outdone, so drove to the other end of the walk and did it in reverse (not literally). It was a nice walk, although dare I say that we’re perhaps a little tramped out (especially me), having done little else for four weeks. As I mentioned Akaroa is only little and they haven’t really reached the giddy heights of internet cafes. Instead, they have an interesting internet system, whereby you put money into a small metal box on the wall for usage, a bit like old-school sweet machines outside shops. Unfortunately, and how French is this, having put your $4 in, the internet turns off and remains dormant for ever, as far as we could discern. Whilst the kiosk is unmanned, there is of course a contingency plan for problems of this kind. There’s a number to ring. I would have done so, had it not promised to cost me more for the call than the $4 I’d thrown into the box. 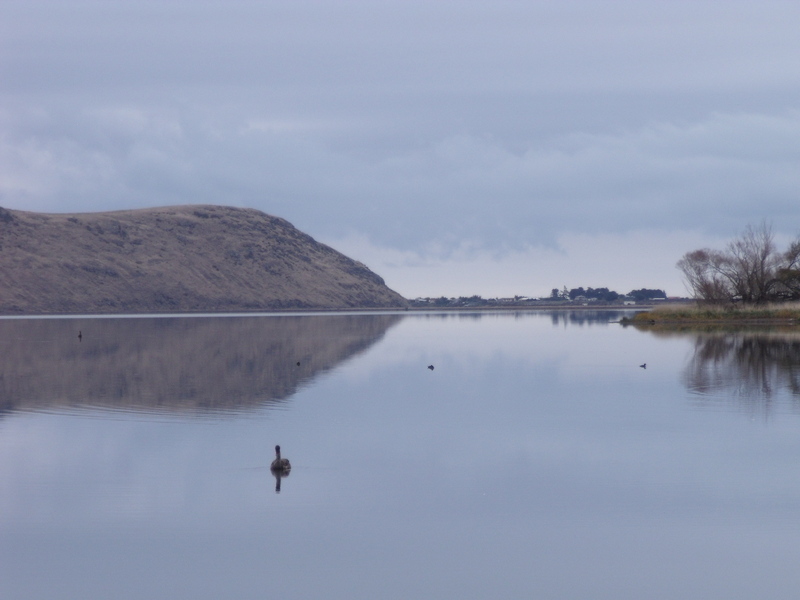 We drove back to Christchurch in the rain. Whilst this may sound all a bit doom and gloom, it’s not all bad. 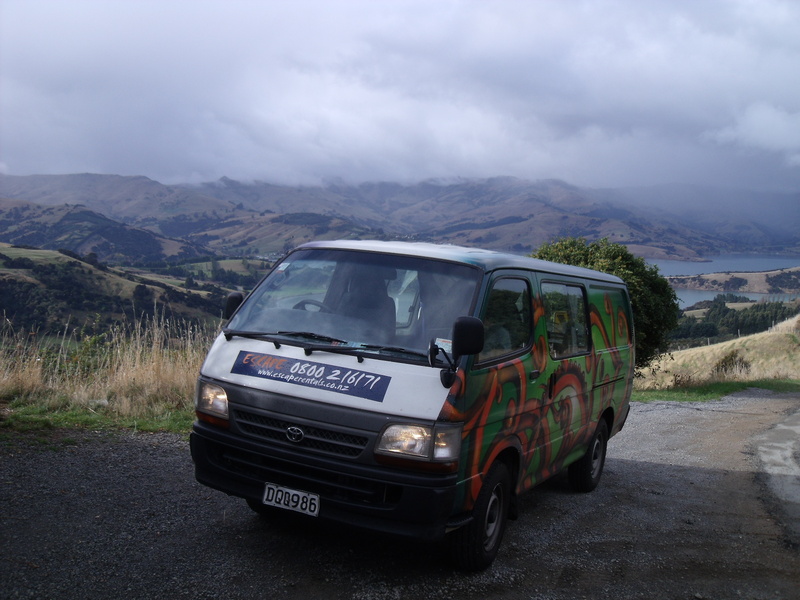 We saw the sun briefly yesterday, and we dropped the van off without having been killed by idiot Kiwi drivers. We also slept last night right next to the Grand Prix circuit at Albert Park in Melbourne. Hold on a minute, that’s not right……… it just sounded like that, with more idiot drivers with over-sized exhaust pipes racing around all night. This must be where the Kiwi police send driving offenders to be re-educated. So that was our time in New Zealand – we fly out of Auckland tomorrow bound for Sydney, to be met by my mother-in-law for a week or two. Be sure not to miss the next update! I may not have mentioned, but the drivers are astonishingly, jaw-droppingly, eye-coveringly bad here. They have no road awareness, foresight, common sense or skill. Other than that they’re fine. In their defence they’re not helped by the authorities, who should make things non-negotiable instead of letting the idiot drivers decide things like whether they want to overtake on an uphill blind bend – just paint no overtaking lines EVERYWHERE – they can’t be trusted otherwise. Kiwis are very, very friendly people (though strangely and noticeably will never thank you for letting them go first – either in a car or through a door/narrow passageway). Kiwi enthusiasm can go a little too far – as I alluded to in one of my comments, even the desperately mundane is “AWESOME” whilst making a couple of minor errors when ordering food, or providing a ten dollar note for a $4.26 transaction is somehow “perfect”. It’s amazing how many people walk around with no shoes and socks on – remember it’s autumn here and not warm. On that theme, why would you go out in flip-flops and shorts but then wear a puffer jacket and a large woollen hat? The raw produce is excellent – I’ve never tasted carrots so good for instance – but eating out on the couple of occasions we’ve done so has been a real disappointment. I suspect you have to go to the nicer places to get a decent feed. Pies in particular have been a real low point after being given a massive build up by the guidebooks. Greggs should get over here, they’d make a killing. Coming here to do things other than walking and visiting national parks would be a very expensive business. Taking children would entail spending the GDP of a small European country (obviously not Greece’s). There’s nothing more annoying than shelling out $25 a day for a fully comprehensive vehicle insurance policy only to go unscathed throughout. We were almost hoping for a minor bump towards the end. Campgrounds on the whole have been excellent, though in Canterbury they became a little “Deliverance”. Fosh = good. Chops = poor. If you’ve got a portable DVD player in your camper van, you could do worse than buying Band of Brothers and the first 2 seasons of Family Guy. There is seemingly no natural feature that can’t be improved by a jet boat ride. The drivers here are truly rubbish. I’d just like to say how honoured i am to have won the van naming competition, its the first thing I’ve won since i got a fruit basket in the brownie raffle when i was 8. I’d like to thank Dino, Anna and Amber for all their support and encouragement, and Hanna Barbera for inspiring me. What do i win? Also, quick question, are the drivers in New Zealand any good? You win a stroke of the beard in August. It’s a much coveted prize, I suspect you won’t sleep much between now and then. No gags about nightmares please. More good stuff for the book. What seems to be a slight fit of the blues will be hugely relieved by the news you have been tensely waiting for – yes, Blackpool will be in the Premier League next season, in nice time for relegation at the end of it. Enjoying the updates Tom. I’ve been for an interview this afternoon and looks like I’ll be in the Anfield hot seat by the time the World Cup starts. Need to look out for some players I can replace Torres and Gerrard with. See if you can meet up with big Mark Viduka whilst you are downunder. Thought I could play him in the hole like Gerrard used to. If I can persuade my old mate Fergie to let young Micky Owen come home, we’ll be laughing. £10M should be enough to tempt Sir Alex I daresay.